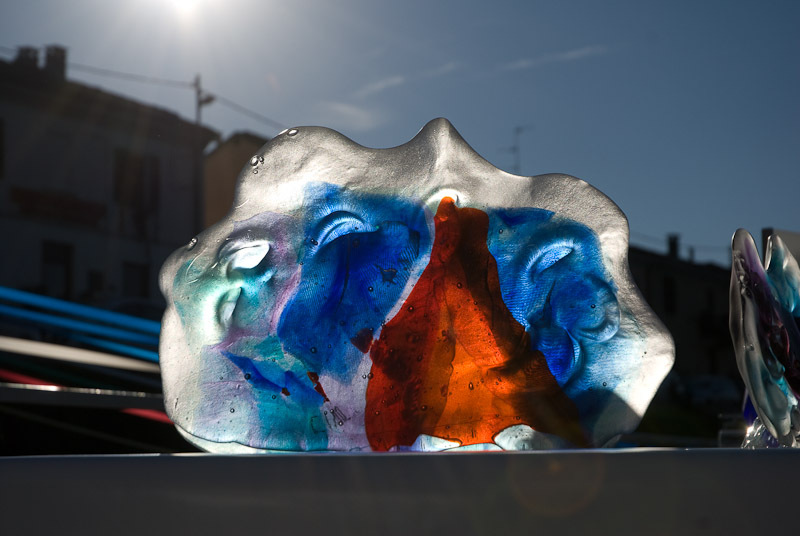 Glass sculptures to capture the sky, to unite with the earth, to dominate fire - to express her belonging with water, the element in which her work and her spirit find place: hers are Water thoughts. Shapes - to make you feel one with Nature, to mark a memory, an emotion, to tell a shiver, an irony at times, to describe the place where Nives Marcassoli lives and works. There where the river flows, where the grass grows on the ditches and the croaking of tree frogs can be heard. An hymn to Nature, nourished by the Sense of Light, that transfigures the shape to enclose light, so as to let it filter through the glassy mass and keep it within. The effects are extraordinary, summoned by a wise alchemy and pervading all molecules, like reflections imprisoned in a treasure chest, in a glass prism, that returns purity. Glass: the medium with which Nives expresses her talent, the glass so celebrated throughout time. Glass, that ancient and prodigious matter known in days of yore, charms the artist, who starts from an undefined mould and bestows a soul on the shape, born from the fusion and assembling of cut glasses. Nives senses her work by intuition, she elaborates it with her thought, then gives in to her creativity and leaves the final touch to the fire, guided and controlled with skill. And it is exactly to the secrets hidden in her strength, to conferring with the mysterious god, with the element that shapes and melts glassy matter, that she commits her project, her work. Nives's passion looks at a glass. Sculpture without being satisfied with a shape born by chance: she creates a second one, then a third one and even more, if the result is not what she desires. Towards the possibility of shaping the idea, of confirming the signs, the colors, of hosting metal elements, of creating smooth surfaces, but even rough or jagged ones. Giving birth to light shapes, transparent like organdie, like laces in a doll's dress: thus, a sculpture made of light, fragile and pink, by the name of "Passione d'organza". And the glassy substance brims with color, it discovers its new identity, it transforms - abiding by the will of its creator - it transforms to meet a new expressivity as it bestows beauty. It is a result that stems from challenges, because this is the only way this woman can feel alive: it is the strength that urges her to overcome the limits, those of physics, those of the mind. It is there that Nives' work finds its roots. That élan towards continuous researching, towards creative action that accompanies man since the dawn of life. Charmed by glass, her passion for a long time, she gives life to (common) objects, brimming with intense chromatisms and elegant signs. Sculpture is then her natural landing place. It is not me that looked for it, it is sculpture that found me, as she herself said. Ail her preceding work and her latest devotion are the manifestation of but one language, a hymn to life originating from matter itself, a hymn to light - that gives expression - to water - that generates life itself - to the sky above us - where souls die. Life is a flimsy place, the sky is so close, as a great Italian photographer wrote. The stylistic figure of this eclectic artist describes a work in fieri, flush with stylistic references and solutions, profiting from noteworthy technical capabilities and creativity: a path, on a quest for a new three-dimensional expression, under the sign of an ancient modernity.